Designed for use in hospitals, clinics and doctor's practices, the Dominant Flex and Basic are the optimal medical suction pumps for all suctioning needs. 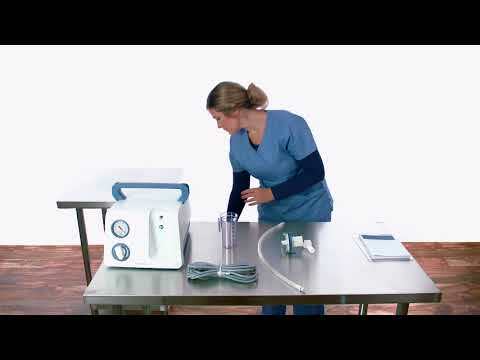 These Medela pumps are the latest innovation in high-vacuum suction. The heavy-duty piston-cylinder system creates whisper-quiet and robust operation. The pumps offer a strong alternative to wall vacuum, as the independent vacuum avoids overflow into wall systems and provides a smooth, consistent, and reliable vacuum level. Powerful drive unit is whisper quiet at < 40 dB(A) 1 , thus reducing distraction during surgery. Hands-free operation thanks to on/off foot switch. It is designed to last a lifetime. 5-year warranty. Versatility in all forms: the high-vacuum pumps are available in rack, portable or mobile versions with trolley. The inner construction simplifies routine checks and can thus reduce costs. Medela suction pumps can be used for various applications in hospitals, outpatient surgery centers, clinics and doctors’ practices: general surgery, liposuction, endoscopy, wound drainage and any other application where a reliable and precise suction source is needed. The Dominant Flex provides superfast ramp-up of the vacuum at a flow rate of 60l/min for increased performance and faster suctioning. For sensitive operations where minimal noise is key, the noise level can be reduced simply by touching the 40l/min button. Flow rates can be selected intuitively at the touch of a button. A simple touch delivers increased performance or reduces the noise level. The smooth, single-piece hood design facilitates cleaning, and the materials can withstand potent disinfection agents. The pump can be conveniently placed in endoscopy towers, at the patient's bedside or in the operating theater as a rack, portable suction unit or mobile version. The Reusable or Disposable Collection System from Medela’s wide range of accessories completes the unit. To protect the pump from overflow and particles and the environment from bacteria and odour. For hands-free vacuum regulation and quick release. The videos are for demonstration uses only and in no way replace the IFU. American Journal of Neuroradiology: "Under Pressure: Comparison of Aspiration Techniques for Endovascular Mechanical Thrombectomy".